Aly Ismail and Lisa Nguyen are the owners of Minh Thuyet’s Vietnamese Bistro. They named the restaurant after their daughter Yasminh. 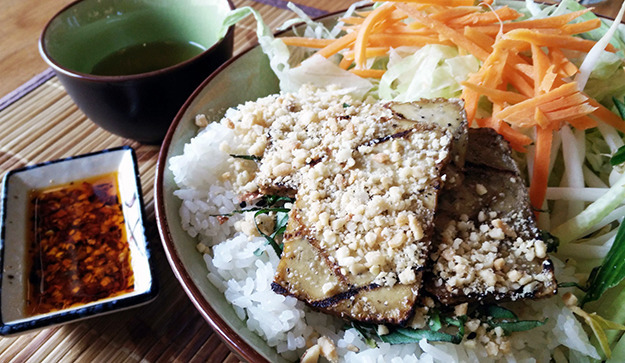 Minh Tuyet’s Vietnamese Bistro is not your grandma’s bistro, though she’s more than welcome. Located at 415 A Victoria Road and open 11 a.m. to 11 p.m., Tuesday to Sunday, the restaurant is both stylish and unique. For Ismail and his partner Lisa Nguyen, opening a Vietnamese restaurant made sense. Aly has been influenced by Pacific Rim culture since his days at the University of Alberta, where he had many friends in the Asian community. “The majority were Vietnamese or Cantonese and they were my colleagues and classmates, so I fell into the culture,” he explains. Photo: The menu at Minh Tuyet’s emphasizes fresh and healthy ingredients. For Nguyen, Vietnamese culture is part of the daily life she was brought up with. Ismail is a third generation chef, following in the footsteps of his mother and grandmother before him and is trained in classical French cuisine. Nguyen, a former consultant for project and change management strategies, is not a chef. “The first time she cooked me dinner we had alfredo Sidekicks,” Ismail laughs. 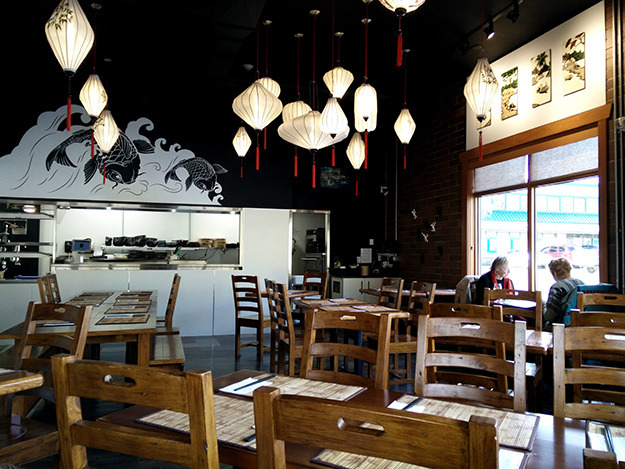 Named after the couple’s daughter, Yasminh Tuyet, Minh Tuyet translates roughly to ‘snowfall at the break of dawn.’ Even name of the restaurant suits Revelstoke down to the core. Efforts were made to ensure all the produce used is locally sourced and sustainably grown, and the meat ethically raised as well as being hormone and steroid free. There will be no Sysco food truck deliveries. This fresh fare is part of a long term plan for them. Inside Minh Tuyet’s, Vietnamese lanterns made for the restaurant hang from the ceiling at various lengths. The black and red walls are home to large images of koi fish. Beautiful Vietnamese art adorns the walls, large windows and wood finishings keep it warm and creative but not cluttered. Diners can see into the kitchen and watch their food be prepared. Ismail planned the interior design, from the material and aesthetics to the kitchen layout. Fully licensed and kid friendly to boot, Minh Tuyet’s is a boon to the incredible cultural diversity hosted in Revelstoke’s dining and drinking scene.